Why might you cut a tree down in a landscape where trees are as scarce as trillium in a deer-infested forest? This is what I asked Joachina and Fermina when they took a rare break from whirling around the 25-30 foot tree, which had been chopped from the base of El Misti mountain in southern Peru, and dragged and set into the center of a playing field, only to be ceremoniously axed once again. “It’s tradition,” they replied. Then they returned to the business of swirling their beautiful costumes while skillfully balancing the traditional hats perched precariously atop their heads. Being a skeptical American I thought, there must be more to it than that. And no doubt there is, but either the origins have been lost in Incan history or they are a deeply held secret. At the end of each Carnivale (of which there are many in Peru) the native people don their fine costumes, each representative of a particular region. The drag a tree to the scene, decorate its branches with small gifts and balloons, and dance from afternoon until the job is done. Each dancer takes an occasional ceremonial whack at the trunk until at some point late in the evening—these things can’t be rushed—the tree falls and releases the gifts from its branches. The winning whacker gets the tree. 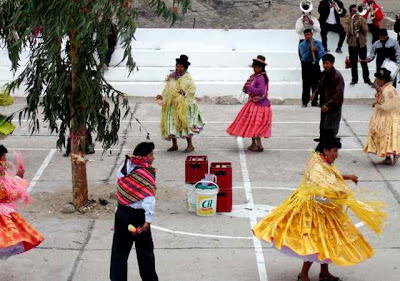 The ceremony (well, party—the dance requires tall stacks of cases of beer) I witnessed was on the outskirts of Arequipa, a dirt-brown city of about a million people that sits 7800 feet above sea level on the desert coast of Peru. Joachina and Fermina had moved to Arequipa from a much smaller, much higher (12,500 feet), and much greener city, Puno, which is on the shore of Lake Titicaca. Thus they wore the handsome skirts and hats from that region. Could it be that the tradition made its way from the rainier, more mountainous regions to the dry areas closer to the coast? Although that particular mystery will remain unsolved, I came away with other insights. Tradition and ceremony offer great rewards. The carbon value of a single tree was vastly outweighed by the joy it brought to the Carnivale participants. In our culture, we just don’t dance enough. How big? 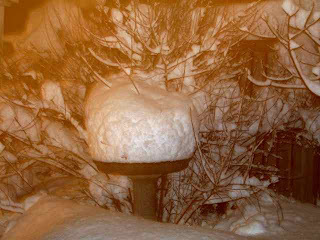 Maybe 17 inches. Big. Big enough to keep my spinach and garlic very very snug. I expect big things from them in spring, because snow is good for the garden. 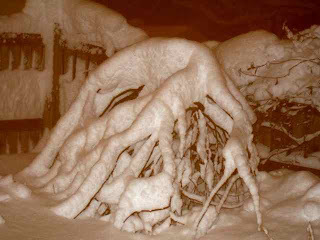 A good snow cover keeps the ground at a steady temperature, preventing freeze/thaw cycles that are damaging to plants. 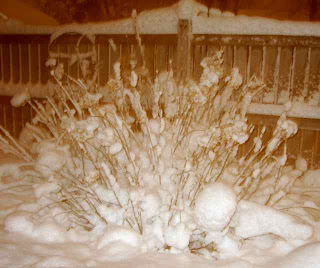 A really good snow cover will protect plants from deer browse. Unfortunately it may make them more vulnerable to mouse and vole damage. 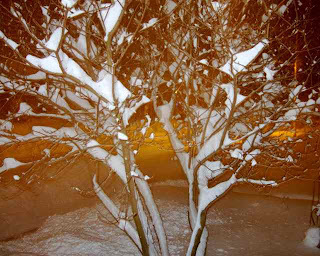 Snowfall takes nitrogen from the air and releases it slowly into the soil. Very little of it ends up in the storm drains. 10 inches of snow = 1 inch of rain. 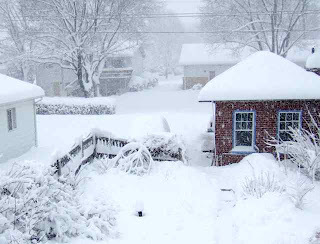 10 inches of snow falling on an acre of ground is equivalent to about 27,150 gallons of water. That’s 113 tons. fields and woods, if you would keep your spirits up. Deal with brute nature. Be cold and hungry and weary."